The 1999 vintage saw a rather cool summer. Winemakers and growers worried if untimely rains might spoil the vintage, but the sun gave warmth to the end of September, allowing vintners to harvest ripe fruit with reasonably good levels of acidity. 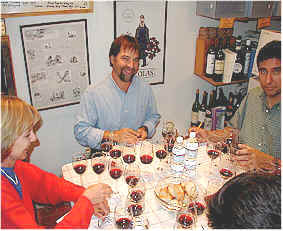 This was our second 1999 Zin tasting and we found the quality to be good, but no wine "ran away" with the tasting. I suspect many 1999s will take a while longer to blossom than, say, 1997s. DeLoach: At least they're consistent. Notes compiled by Robert Gorman with Gerald adding his two-cents' worth. 8th Place: DELOACH 1999 Russian River Valley Gambogi Ranch One taster found a mouth-puckering sour berry component and another found it sour with a note of mustard seed. Curiously, another found it flat and low in acid. A defender of the wine liked it. Its full bodied with lots of raspberries on the nose and palate. For Bob, Loganberry jam jumped out at me with oak and spice giving it a nice tone. Soft and jammy, this is a drink for now. Gerald found hints of berries and herbs with a rhubarb-like fragrance. While not particularly profound, this is a pleasantly acidic, mildly tannic Zinfandel with reasonable fruit. Modest aging potential, perhaps 3-5 years. I'd give it a half-star rating on my three star scale. 7th Place: DELOACH 1999 Russian River Valley Barbieri Ranch Tasters found lots of green stuff in this wine: green asparagus, green tannins, green stemmy notes, green celery and an herbaceous finish. Other descriptors included sour, cedar, a sulfur component, and barnyardy. Another found it tangy with hints of quince. "Sulfur, silage and green peppercorns" were the elements found by some else. Bob found it bright, sharp-toned (bordering on shrill) and at the same time ripe and jammy. He attributed this to old fashioned canopy management which increases the tendency of Zinfandel to ripen unevenly with green, unripe berry clusters mixed in with ripe clusters and some raisined berries. He did find some nice blackberry Zin fruit and perhaps a hint of wild yeast? It works well enough in an old fashioned way. Gerald described this as having a "slightly stinky note...for once I have detected the silage element one taster is so found of pointing out. This seems to dissipate with aeration. Mildly tannic and a bit aggressive, it has nice fruit but a bit more tannin than it needs. Five to eight years of cellaring potential. Half star rating. 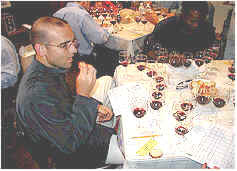 6th Place: DELOACH 1999 Russian River Valley Papera Ranch Coming in sixth place, a taster found this a funny wine with blackberry and green apple on the nose and highly acidic and bright on the palate with red fruits but thin on the mid-palate. Another found sour fruits, astringency and heat: a shrill and disjointed wine." Bob spoke for the 4 tasters who liked this wine. 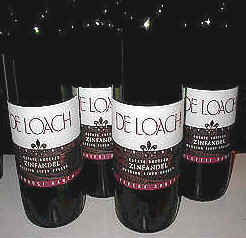 Its a bright, easy, berryish Zin (a delight!) Ripeness is not pushed or forced. On the palate there are Zin berries in spades and lively acid. It fills the mouth. Not very deep but still a winner! 2+ years development. Gerald found this to be a bit hot, though it has typical Zin fruit. Nothing especially exciting..."a good ten buck red. Too bad it's $25." There was no denying the presence of the wild yeast Brettanomyces with its wet dog character. One taster said, flat out that Brett doesnt belong in Zin. A more conciliatory taster found plums, waxy, warm berry and herbs. Another found that it started out bright and then just faded away. Bob found Taffy, burnt sugar with underlying Brettanomyces (nicely leathery actually!) and some Zin fruit in there too. Its jammy and spicy; fairly attractive but old-fashioned. Gerald didn't pick up the Brettanomyces on the nose, finding red fruit fragrances and a touch of spice and cocoa. "It does show a leathery note on the palate and is not particularly charming, nor offensive." Three to five years of aging potential...half star rating. This interesting wine generated a whole raft of descriptors. One found coffee, cedar, candied raspberries, a dusty note and okay tannins." A second taster found earthy, wild berry, slight sourness, heat and minerals. Another taster agreed on minerals but felt that this softened and evolved. There was nice ripe juicy fruit but too much oak for Zin. Someone else agreed, noting that the oak contributed too many harsh wood tannins. Bob liked its fragrant nose: spice and lots of American oak with its characteristic vanilla and pickle-barrel sharpness. On the palate there were darkly ripe Zin berries (borderline over-ripe). Wild-berry jam and some heat. So it's over-ripe and over-done but you gotta love it! Gerald was charmed by this wine, finding a pleasant vanillin and cedar fragrance with lots of sweet berry fruit. On the palate there's a creamy character and a touch of mocha with just a bit of mouth-drying tannin. One-and-a-half stars. Five to eight years of aging potential. This third place wine found one admirer. The wine is terrific and lively from piquant berryish fruit on the nose to moderate/high tannins with balancing fruit on the palate. By contrast another taster found it simple, with hints of berries and forest underbrush but basically watery, bitter and out of balance. Another noted its bright cranberry/raspberry fruit and nutmeg-like spice. Bob also found an element of forest underbrush attributable, perhaps, to lees contact. There is bright, almost sharp-edged brambly fruit, rather Italianate. But quite a mouthful! A terrific chew, old vine intensity, a tad hot, overripe but! Gerald felt this stood out from the group for its intensely fruity aromas, reminiscent of a whole-berry fermentation (to some degree). "Simple and fruity, but very nicely done. Bright acidity gives this a zesty vitality...if I can liken it to an Italian red (as Bob does), I'd compare it to a tangy Chianti or bright, youthful Barbera. One and a half stars. Three to six years of aging potential." One taster summed up this second place entry as big, rich, with Loganberries, chocolate, coffee and dusty berries and a very spicy, dry, astringent finish. One taster found soy sauce and molasses and another iodine. Bob was much less impressed. The wine has a metallic edge (like tinned chicken) but theres a thick core of blackberry Zin fruit with oak supporting nicely. The wine is thick and ripe on the palate but the somewhat flat fruit just sits on the palate without doing anything. Gerald found "a touch of a jammy note with some woodsiness to the fragrance. Moderately tannic and mouth-drying with a berry tone and light oak. One star. Three to eight years of cellaring potential." Bob found a nicely restrained nose; dust, berries, sweet oak; and (yes) a candy-like edge. Traces of malolactic give it a slightly creamy note. Quite a mouthful! berries with a somewhat wild/earthy tone typical of Napa Mountain Zin. In spite of an odd, chalky & green stems finish; it's A - O.K.! Gerald found the fragrance to be the most typical with its brambly notes and ripe, spicy aromas. There's a peppery note to the flavor and lots of bright, zesty Zin fruit. Two stars. Five to eight years of aging potential.